A 54 year old female underwent hysterectomy with bilateral salpingooophorectomy for uterine fibroids. One fallopian tube showed a well circumscribed nodule consisting of round to irregular pseudoglandular spaces lined by a single layer of cuboidal cells. The cells stained positive with Calretinin and pancytokeratin. The diagnosis is Adenomatoid tumor of the fallopian tube. 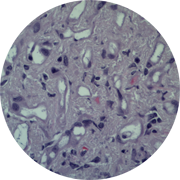 Adenomatoid tumors are the most common benign neoplasms of the fallopian tube and are usually asymptomatic. They are usually an incidental finding discovered in middle-aged or elderly women.